Four photographers explore the causes and consequences of real-world conflict at Space. Conflict, a remarkable exhibition at Space Gallery, presents the work of four photographers offering unique and often poignant perspectives on the theme. Guest curator Jen Saffron was sparked to invite the artists by her observation that most conflicts -- whether in war, poverty or everyday strife -- are reported by the media as simple "happenings," rarely in terms of the complex systems behind them. Jason Cohn's work focuses on socioeconomic disparities -- the sort of inequalities that lurk behind much historic conflict. 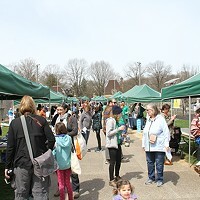 Cohn is not only a widely published editorial photographer, but also a Wilkinsburg borough councilor and activist for such causes as the Greater Pittsburgh Community Food Bank. At Space, his high-contrast black-and-white photographs are grouped into five loose "collections" highlighting inequities confronting the aged, the impoverished and the disabled. Yet while Cohn's point is clear, the relationship between the images in each series is often more poetic than didactic. In his "Transportation Series," an image of an older man waiting at his window for a ride is coupled with an image of a blind man -- merely attempting to make his way outside. In the "Food Bank" series, Cohn seeks to move viewers past their preconceived notions about those who utilize charity. One of the more pointed images depicts a single dad of four and his young daughter, both bent in prayer over modest plates of Spam and vegetables. Pittsburgh-based photographer Renee Rosensteel presents two collage-like installations. "48th Brigade's Train-Up for Deployment in Iraq" consists of 60 shots of National Guard soldiers participating in mock-war situations at Fort Stewart, Ga. Rosensteel (who is married to City Paper arts editor Bill O'Driscoll) aims to emphasize that these soldiers -- many of whom thought they would never be called to Iraq -- are average people suddenly required to participate in a situation that is anything but ordinary. Images of non-military individuals who are hired by the day to portray the "enemy" are strangely ironic -- it seems everyone is "playing" war -- as are photographs of soldiers who look entirely too young or too old to be sent to war. Rosensteel's "Afghanistan" series is a collection of 50 photographs of Afghan civilians emphasizing the little-known fact that in modern warfare, about 90 percent of victims are civilians. Many of the images are artfully posed portraits of children, women and the elderly; others depict land-mine victims and other carnage of war. Some scenes seem out of place in a conflict-stricken country: an amusement park, children hamming it up for the camera -- making us wonder why such normal things should seem so extraordinary. Conflict also highlights the work of Chris Hondros, a widely published and Pulitzer-nominated photojournalist based in New York. Hondros has captured amazing images of dramatic events unfolding in war-torn areas around the world, often with a surprising concern for aesthetics. His "From the Back of the Humvee" series, shot in Iraq, consists of six prints arranged in a grid. Each image is artfully framed in a thick black band (the Humvee's rear window). The composition makes the photographer seem almost safe from the turmoil outside -- but of course we know he is not. 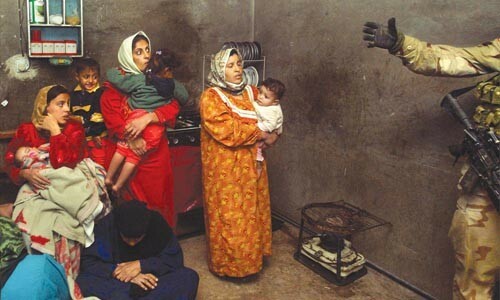 In the single image "Iraqi Family Looking at Soldier," a cluster of Madonna-and-Child-like figures huddle in the left of the frame while the arm of a soldier enters from the right, not unlike the hand of God pointing at Adam on the ceiling of the Sistine Chapel. Finally, Pittsburgh-based Larry Rippel offers a more conceptual approach. "No War Here" Nos. 1-5 are grids of images depicting Americans going about their daily lives at, for example, sporting events; printed in the center, in Barbara Kruger-like red, is the comment -- or question -- "No war here!?" Also on view are some 100 Parade magazine covers, collected over a two-year period and mounted on the gallery wall; the final cover has been digitally manipulated by Rippel to show George W. Bush with the caption, "No War Here, Everyone Go Shopping."